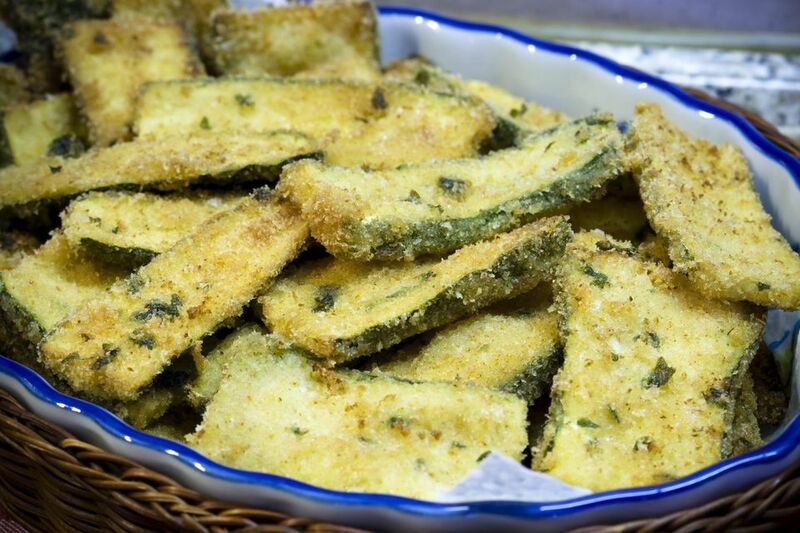 Crispy, batter-fried zucchini—Kolokythakia tiganita, pronounced koh-loh-kee-THAHK-yah tee-ghah-nee-TAH—is a Greek favorite often served in taverns. It is usually part of a meze platter, perhaps alongside batter-fried eggplant and accompanied by a cooling cucumber yogurt sauce (tzatziki). This recipe serves four as a side dish or six to eight as an appetizer—meze in Greek. There are a few tips you need to follow to assure that you get crispy zucchini instead of soggy zucchini. First, make sure the zucchini is cleaned and dried well, and be sure to slice it evenly so all pieces cook at the same rate. The key to great crispy zucchini is to slice it thinly and fry it at high heat so it has time to cook without absorbing a lot of oil. If the oil isn't hot enough, the zucchini will soak it up and come out greasy. It is important the oil reaches—and maintains—the correct temperature for frying (which is usually between 350 F and 375 F). Wash the zucchini thoroughly in cold water and pat it dry. Trim the ends. Slice the zucchini lengthwise into strips about 1/8- to 1/16-inch thick. Cut the zucchini slices in half if they're long. Slices measuring about 3 inches work best. Place the slices in a bowl with the salt. Let them sit for at least 20 minutes, and up to 1 hour. Pour the soda water into a bowl. Slowly stir in the flour and salt, using a whisk or a fork to mix. Bring the oil to high heat. Coat the zucchini with the batter. Use a fork to place the pieces in the oil. Fry for about 5 minutes until golden and crispy on both sides, flipping them over about halfway through. The batter will puff up and the zucchini center should be soft when they're done. Drain the zucchini on absorbent paper toweling just long enough to remove the excess oil. Serve hot. Use a cheese slicer, a mandoline, or a long-blade knife to get uniformly thin zucchini slices. Fry the zucchini slices in a single layer to avoid sogginess. Use more than one frying pan, if necessary. Add any favorite herb to the batter, like oregano or thyme. Minced garlic will give it added spiciness if that's your preference. Serve this dish hot! The zucchini will turn to mush when cooled to room temperature.